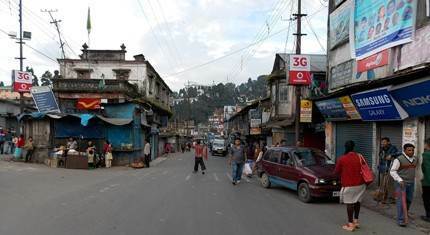 If you want to experience a marketplace where most of the locals in Darjeeling come for shopping and marketing, then try out the lower market area known as the Chowk Bazaar. Chowk means a junction and Bazaar is a market in local language. This place is always jam packed with shoppers and vendors. Being on the main Hill Cart Road where the main taxi, jeep and bus stands are also located, the place is also extremely busy with passing motor traffic. This is where the real bargains take place in Darjeeling. Also known as the Lower Bazaar, Chowk Bazaar is a flat land area measuring some three to four blocks of a city and located at a lower level. There are roads (including Ladenla road) that go down to the market area. If you walk down from Chowrasta (Mall) area, it'll take around 12-15 minutes. However it's a crowded, dusty and a noisy place, and you are most likely going to be confused trying to find your way through the sea of people and vehicles. But it's colorful and a treasure trove. If you hang around, you will feel the vibe of the interior of Darjeeling's culture. You will get almost every household things and bric-a-brac of all kinds here. There is a large vegetable and fruit market. Tea is sold in small packets for retail consumers to large bulk quantities for the dealers. And there are large number of shops selling miscellany of products starting from groceries to woolens and small crafts (woolens are really cheap here). Take one of the several narrow alleyways or lanes. You will find small stores lined up on both sides selling all kinds of items including clothes, umbrellas, shoes etc. From Chowrasta Mall down towards the Post Office in Chowk Bazaar, the narrow roads are full of curio shops and eateries. Some of the popular items at Chowk Bazaar that attract budget minded tourists are carved boxes, masks, handspun textiles, fur caps, embroidered work, rugs, brassware, silverware etc. The Super Market and Fancy Market are also located in the Chowk Bazaar area. These two market areas are also full of all kinds of stores including clothing & dress materials, household products and lot more. On Saturdays and Sundays the traders and merchants bring in bulk goods from nearby villages. You will find the bazaar area thickly crowded and humming with lots of people around. Most shops in Chowk Bazaar area are closed on Thursdays, only exceptions are medical shops, bakery outlets and some small stalls. There are several eateries, restaurants and even an outlet of Glenary's Bakery here. There are two other shopping complexes nearby - The Dragon Market and Mahakal Market, housed in two buildings opposite each other and located on lower part Ladenla road (that leads down from Gandhi chowk or lower clubside taxi stand). You can get excellent beadwork, batik prints, sculptures, handicrafts etc here. Mahakal market is especially great for woolens. Dragon market is known for fashion wares sourced mainly from Bangkok including ladies shoes, sandals, jewelry, accessories, watches, T-shirts etc.